My name is Carli, and I’m organized. No, I’m not one of those people who should have her own show (think Hoarders), but I do place a great deal of value on organization. So should you. Businesses and individuals run at their peak when efficiency is made a priority. And in my mind, one of the easiest ways to adopt an efficiency mindset is through the practice of organization, which, luckily, is a trainable skill. 1. Have a central to-do list. Plan your day ahead of time on a daily basis. I write down everything I need to accomplish before close of business. Prioritizing and time management are vital to making a to-do list work. Sure, there is nothing magical about a to-do list in and of itself, but when constructed with forethought, it allows me to stay on task and not get sidetracked by the inevitable daily workplace distractions. 2. Have a tidy desk. A black hole of papers and office supplies makes it easy for people to lose their otherwise-organized minds. 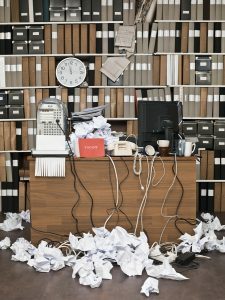 We all know people who consider their desk an “organized mess,” with a mass of cluttered papers and files. However, don’t confuse being able to work in clutter with being able to thrive in clutter. Typically, it’s more the former than the latter. Having a daily routine can help you feel less scatter-brained, which results in less procrastination and makes it possible for you to get work done in a timely manner. If we train our bodies and our minds to work at specific intervals, we become accustomed to the ritual. This is true in both your personal life and professional life. 4. Manage time instead of multitasking. Instead of trying to do multiple projects at once, try focusing on a single task instead. We all have colleagues who attempt to talk on the phone while responding to emails and putting a presentation together simultaneously. It’s impossible to focus all of your energy on any one task when you have multiple balls in the air. Prioritize, then check things off the list, one by one. 5. Use your email calendar. Limit yourself to one calendar to help you get better organized. Using multiple calendars can become a source of confusion and miscommunication. I used to juggle multiple calendars at once, before I realized it was leading to tasks falling through the cracks. If you have one calendar to work from on a daily basis, it will minimize missed activities and simplify your life! No systems works the same for everyone. But I invite you to add one or two of the elements above to your daily routine. I’m convinced you’ll quickly realize significant benefits from the effort. How do you increase your productivity? Join the conversation below!